Our three-supermarket sandywar continues with another entry in the peppered turkey and colby on sourdough with tomatoes and mustard showdown. Albertsons finished second in the Supermercado Sandy Spectacular’s first round; how will it fare in round two? This was the question in my mind as I loitered near the Albertsons deli … scanning, observing. Before I approached the counter, I got a metaphorical taste of what I was about to experience. A somewhat timid and confused man, who spoke only Spanish, walked up to the counter and asked the sandwich artist (whom I will refer to as Jack from here on, as he looked like a Jack and I didn’t get his name) a question. Jack responded with a sunny “Si, Si!” and took the man over to the imported cheese island, where I was lurking and pondering a hummus purchase while I watched and waited. Jack found the exact cheese the man was looking for, and said several words in Spanish, one of which I believe translates to “Tuesday.” The stranger was visibly grateful. Following this display of superb multilingual customer service, I followed Jack to his counter and asked for a custom sandy. As I expected, Jack was professional and friendly, anticipating my questions and guiding me through the sandwich creation process. The details aren’t interesting, although I should mention that in sharp contrast to the King Soopers sandwich artist, Jack gave me a choice of mustard. I metaphorically jumped at the chance to sample his brown. Overall Taste: Bland but appealing. This sandy had less black pepper kick than the King’s, but the brown mustard helped offset that. Jack’s preparation was speedy and accurate — I could tell he’d done this before. The flavor was interesting enough to carry me through the eating experience, but I would have liked more zazz. Bread: Although you’ll rarely read this in It’s What’s Between, this was the odd sandy where the bread-to-filling ratio leaned too far into the filling side. And keeping with the sandy’s theme, the sourdough was mild and could have been tangier. Another issue: the crust fell off like skin from a leper. Seriously, as I gently ate the sandwich, the crust fell right off! I don't know for sure what caused this phenomenon, but I believe the bread was too fresh; perhaps a crustier bread would have been more stable. The answer’s beyond my ken, so I’ll need to phone the sandylab on this one. What’s Between: Filling was more than ample. This sandy was a genuine two-incher, with seven distinct layers filling the bread slice gap. That’s three layers of turkey, two of cheese and double-decker tomatoes. Though I first feared its stature, the sandwich proved to be a comfortable mouthful, with no jaw strain caused on the bite. Value: Fairly fair. The sandwich was a filling meal in itself — chips would have sent my lunch into an uncomfortable place, such as a car trunk. 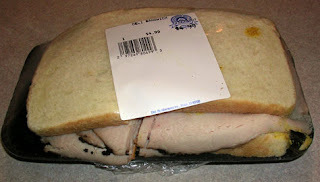 King Soopers’ sandwich cost $4.31, compared with $4.99 for Albertsons’. The latter had approximately 13.8 percent more topping mass, so the higher price is justified. But I’m conflicted on its value here. On the one hand, I like the fixed five-dollar rate, as King Soopers’ complex per pound system is too much to deal with while ordering a sandwich. On the other, five bucks is more than I want to pay for Albertsons' uninspired sandwich, even as filling and well-executed as it was. Customer Service and other concerns: I covered Jack’s refreshingly high quality customer service in the intro but I’ll say it again: Jack’s a pro and his service was top-notch. I have other concerns but will not discuss them here as they’re unrelated to this sandwich.